'A Taste for Hemlock' is a mystical journey of transmutation birthed in the crucible of cultural dychotomy. Grounded in myths and storytelling, Michèle Vassal's vision is uncompromising, incisive, and laden with a rich painterly sensuality. In this book, she unravels, with honesty and sensitivity, the golden thread that runs through personal and collective memory, honouring both the frailties and beauty of our humanity. Originally from the Ubaye Valley in the French Alps, half-way between Provence and Piedmont, Michèle Vassal moved to Ireland in her late teens. In 1999, she won the Prize for a First Collection at Listowel Writers' Week, since then her poems have been appeared in many journals and anthologies and she is frequently invited to read her work at festivals and events in Ireland and abroad. Her two collections - Sandgames (2000) and A Taste for Hemlock (2011) are both published by Salmon Poetry. Some of her poems have been adapted to music, most notably by legendary Skid Row guitarist Jimi Slevin and acclaimed Irish singer/songwriter, the late Martin Egan. She is also an artist and has designed CD and book covers. She currently lives near Bantry (Ireland), with her husband, the piper/harper Brendan Ring. They are currently working together on some recordings using traditional Irish instruments and contemporary verse. Her poems can be found in The Cork Literary Review (issues 4,5,6 and 16), Podium 3, Samhlaich Chairri, Cùm, The Stinging Fly, Books Ireland, The Kerry Anthology, Poets for the Millenium, The Sunday Tribune (New Irish Writing), Leaves, Fish, 10k Poets, Mslexia, Cosmos Review, The Café Review, Gloom Cupboard, Bare Hands, Patte de Chat, The French Literary Review, A Journey in Poetry, Dogs Singing: A Tribute Anthology, Blue Max, Poetry Bus, Even The Daybreak: 35 Years of Salmon Poetry, Poetry Monthly International, The Sea, The Irish Examiner, Visions, On the Banks. She received 1st prize at Listowel Writers' Week and was shortlisted for the Hennessy/Tribune awards, New Irish Writing. She has also been shortlisted in French for ‘La Fureur du Noir’ and in English (Fish Crime Fiction), for her criminally-minded short stories. slopes of le Champs du Fada. Note: A skieve is a quiver and a skene/scian, a type of dagger. 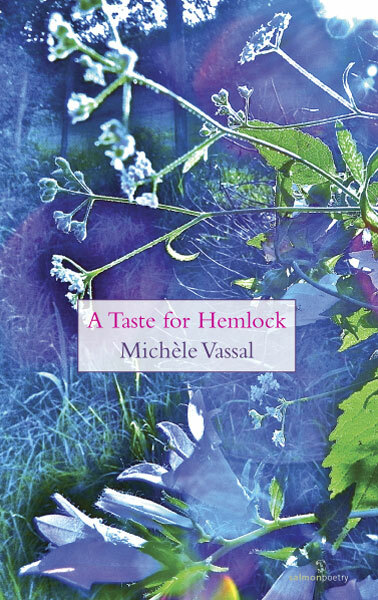 By far the best and most challenging collection of poems by a poet issued in 2011 is Michele Vassal's, 'A Taste For Hemlock' (Salmon Poetry), with a cover by the author. Here is a European sensibility charging through the conventional staidness of much Irish contemporary work. It is richly to be hoped that this book receives the critical attention and promotion that it deserves; a book without decent promotion behind it by its publisher can often sadly wither and die. Ask for this book in bookshops or chase it up online. A Taste for Hemlock, is a mystical journey of transmutation birthed in the crucible of cultural dichotomy. Grounded in myths and storytelling, Michèle Vassal’s vision is uncompromising, incisive, and laden with a rich painterly sensuality. In this book, she unravels, with honesty and sensitivity, the golden thread that runs through personal and collective memory, honouring both the frailties and beauty of our humanity. Each section, indeed each poem is like a way-station in the development of the human spirit enduring and then emerging from incredible adversity into true identity and ability in all its different guises. It has been said that beauty has nothing to do with being pretty. This book bears that out completely. And it still manages to be mythic, absorbing and beautiful. The title poem “A Taste for Hemlock” is a flawless sequence of short verse. It distils the complex, the communal drive to inevitable death at the end of a systemic melancholy thread. “Defining desire and death,” a conceptual, moveable verse, disperses its acquired wisdom beyond the dull ache of long pain, above the throb of ritualistic grief. The verdant background of the book cover, the glistening cerulean undertones understate pure, passionate, pleasure.